The Silk Road is dead. That eclectic online marketplace for trafficking in illegal substances of every kind was raided and shut down in 2013 by the FBI and other federal agencies, who confiscated its multimillion dollar store of Bit coin. But its mysterious founder, known online as Dread Pirate Roberts, continues to confound. This enigmatic figure broke new ground not only by creating a super private drug trafficking site using the anonymous digital currency Bitcoin – but also by his relentless championing of Internet freedoms and the right to personal privacy. Who is Dread Pirate Roberts? The name is a tongue in cheek reference to a character in the cult favorite film, The Princess Bride. And federal authorities think they know. An American named Ross Ulbricht has been arrested as the man behind the Silk Road, with additional accusations of being a hit man and drug kingpin thrown in. Ulbricht is expected to go on trial in January. One of the jobs facing the prosecution will be to prove that he is in fact the mysterious Dread Pirate Roberts in the first place, and that he actually did run the Silk Road. But whether or not Ulbricht is the Dread Pirate, that individual did – and probably still does – exist. And he used his illegal platform to say some pretty honorable things. According to a recent piece from CaseyResearch, the Pirate not only opened his site to all and sundry, no questions asked, he also posted regular articles on the site about the value of this fragile thing called freedom of the internet. He even had a book club, and many loyal readers ad fans. The odd situation of Dread Pirate Roberts points u the contradictions about freedom and personal privacy in this digital age. It also underscores the growing role played by anonymous digital currencies like the Bitcoin in keeping online transactions private. The Bitcoin’s rise in popularity coincided with its much-publicized use on the Silk Road. Bitcoin and other similar digital currencies are stateless and bankless, and can be used anytime two parties in a transaction chose to do so. They’re virtually untraceable, not controlled by any government, and they were the ideal medium of exchange on the Silk Road, where users wanted to leave no trail. That association with illegal activity tarnished the Bitcoin’s reputation and potentially contributed to the demise of other leading Bitcoin exchanges and moves by some countries to outlaw its use in government-backed financial exchanges. Still, the Bitcoin rolls on hailed by civil libertarians as a major step toward personal privacy and financial freedom worldwide. In the writings of Dread Pirate Roberts, the Silk Road founder makes it clear that freedom of choice means just that – the freedom to engage in transactions of any kind anonymously and privately. The purpose of the Silk Road, he says, was not to deliberately encourage worldwide drug trafficking, but to offer a place where people could exercise those freedoms without fear of scrutiny or pursuit. And Bitcoin was the logical choice for a currency that would support that privacy. But the primary use of the Silk Road was to conduct highly illegal transactions of all kinds. Though most if its traffic involved drugs, there were speculations that other, darker deeds were concluded via the site as well. That included the murder for hire schemes Ross Ulbricht was eventually charged with. The US government has defended its takedown of the Silk Road as a necessary step for the safely and welfare of people everywhere. The Silk Ford story was used to justify tightening up surveillance and tracking of online transaction of all kinds – and to demonstrate the dangers inherent in a non-regulated currency like the Bitcoin. And those measures have worked, to some extent. No successor o the Silk Road has risen. And the Bitcoin, from its heady days of trading at prices hovering around $200, has slipped in world markets, retreating from some of its big gains of 2013. But once let out, genies are notoriously reluctant to return to their bottles. The Silk Road story and the hunt for Dread Pirate Roberts points up the double-edged sword of Internet privacy and freedom to conduct personal business in whatever medium you choose. Rosenberg, Paul. “Druglord, Genius, or Saint? 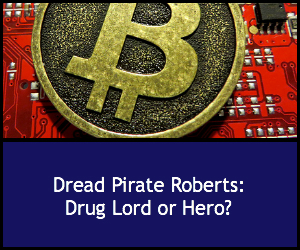 What Kind of Man is the Silk Road’s Dread Pirate Roberts?” A Free Man’s Tale. Casey Research. caseyresearch.com. 7 November 2014.